Ron Lee, Princeton Class of 1980, and a national security, privacy, and technology law partner at Arnold & Porter LLP in Washington, D.C., looks forward to a return visit to the best damn place of all. He will discuss government data mining and commercial data profiling. Although these two topics are often considered separately, they are increasingly united because of the government’s interest in studying commercial transactions to identify and prevent terrorism, the government’s legal authority to access private databases, and the private sector’s increasing reliance on the collection and analysis of personal information and transactions. 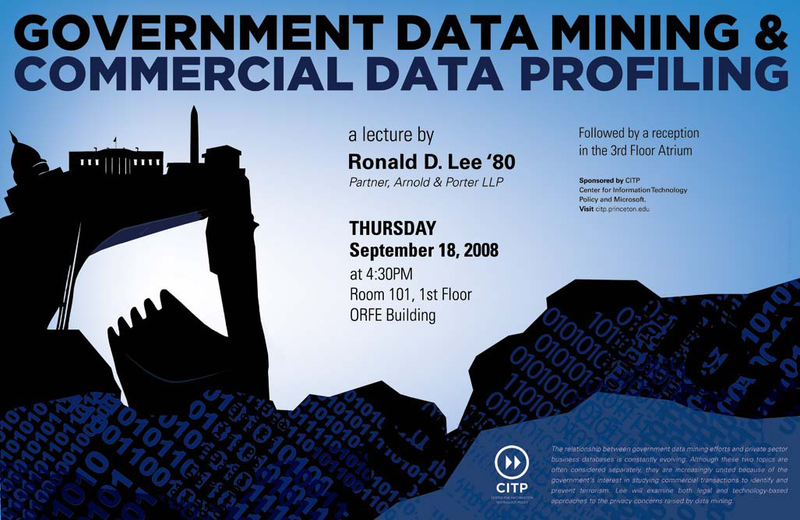 Lee will present emerging consensus approaches to regulating and overseeing government data mining activities, and will consider whether these approaches are transferable to the private sector. He will also examine technology-based approaches to meeting privacy concerns raised by commercial data profiling, and the public and governance issues that these approaches raise. Lee will then touch upon issues raised by datamining at the intersection of law, policy, business, technology, and human behavior where an ongoing public/private/academic collaboration might make a lasting contribution. For more information about Ronald D. Lee, please see his biographical information.